Nerf accuracy has been a hot debate ever since the first Nerf blasters came out. What is the most accurate Nerf gun ever made? It’s very difficult, if not impossible, to answer that question in an objective way. Nerf accuracy has been a hot debate ever since the first Nerf blasters came out. What is the most accurate Nerf gun ever made? It’s very difficult, if not impossible, to answer that question in an objective way. As most of us know, Nerf guns aren’t exactly famous for their outstanding accuracy. But that’s cool, because we don’t buy them for that reason. Nerf guns are toys that (usually) shoot with foam darts so there shouldn’t be any expectations when it comes to shooting accurately. Having said that, when choosing a new Nerf gun, we do look at reviews and videos to see if we can find some stats or other interesting facts about their accuracy. For Nerf this has also been a hot topic ever since the first Nerf gun came out. They have continuously tried to improve accuracy, not just by improving the blasters themselves, but also by making the darts more efficient. The darts that you shoot with your Nerf blaster play a crucial role in accuracy and firing range. Each type of Nerf dart has different characteristics that have an impact on accuracy, such as weight and aerodynamics. Nerf started has been using darts as ammunition from 1992 when the Sharpshooter came out. Darts turned out to be more popular with Nerfers than ball-shaped ammunition so darts were the way forward. The famous Streamline darts that came out in 2006 were known to have pretty bad accuracy due to their inefficient design. The Nerf Elite darts, as part of the popular N-Strike Elite series that came out in 2012, were meant to improve both accuracy and range, among other things. The darts and blasters in the N-Strike Elite range were indeed an improvement in many aspects but Nerf accuracy was still something to have a bit of a giggle about. They simply weren’t accurate. The Mega darts (part of the N-Strike Mega series) are more accurate than Elite darts, but you still can’t expect straight flight paths when using them. Just like with Elite darts, they are quite unpredictable and inconsistent when it comes to accuracy. We would also like to mention the High-impact rounds used by Nerf guns in the RIVAL series. While not shaped like darts, they are actually quite accurate, more so than Elite darts. The recently introduced Accustrike darts as part of the Accustrike series are definitely a huge step forward. 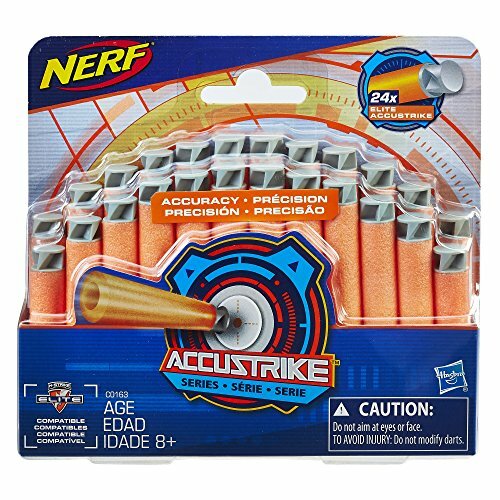 Nerf has tried really hard to improve on accuracy with the Accustrike darts, and while not perfect, they are indeed a lot better than any of their predecessors in that respect. The design of Accustrike darts is quite revolutionary compared to Elite darts, with a different weight distribution and a spin effect when fired. Apparently Nerf worked two years on the design of this dart. Blasters in the Nerf RIVAL series are also a huge step forward when it comes to performance. While RIVAL blasters are known for their power and firing range, their firing accuracy is also very good. It must be noted that Nerf RIVAL blasters shoot high-impact rounds instead of darts. 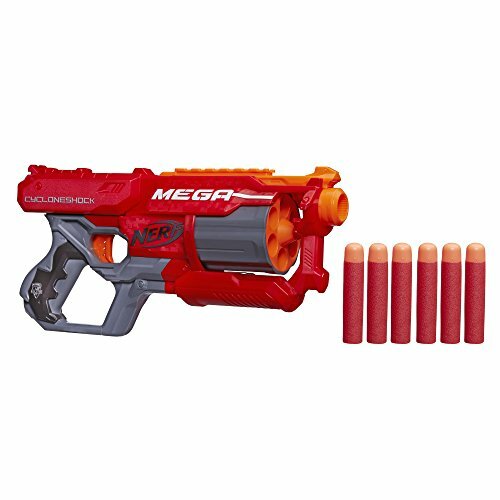 The answer to the question which Nerf gun is the most accurate is heavily dependent on the type of Nerf dart that is being used. Having said that, if the Nerf gun you’re playing with isn’t designed properly, accuracy and firing range will never be impressive, no matter what type of dart you use. Different blasters that use the same dart can still give very different results. And then there’s also the different shooting methods that can heavily affect accuracy. For example, slam fire typically has a negative impact on how accurately you can shoot. The size of the barrel usually also affects accuracy. To figure out which Nerf gun can be labeled as the most accurate, we decided to research the market, interview some of the most hard-core Nerf gurus, read all the reviews and watch all the videos. We must point out that when we say accuracy, we mainly look for consistency. If your Nerf gun shoots consistently in a certain way (for example, with an arch) then you can develop accuracy based on that consistency. It would be easy to simply list all Accustrike or RIVAL blasters here, but that would be unfair towards some of the older blasters that deliver respectable accuracy testing results. In addition, Accustrike darts are backwards compatible with blasters that can fire Elite darts. So, based on all information we have gathered, we have come up with the following list of 6 Nerf guns that seem to be the most accurate Nerf guns ever made. Blasters in the RIVAL Series shoot with high-impact rounds, which are foam balls, instead of darts. RIVAL blasters are marketed towards a more mature audience (ages 14 and up), but this doesn’t mean younger children can’t play with them. The blasters are just a bit heavier than conventional Nerf guns and they are also a lot more powerful. 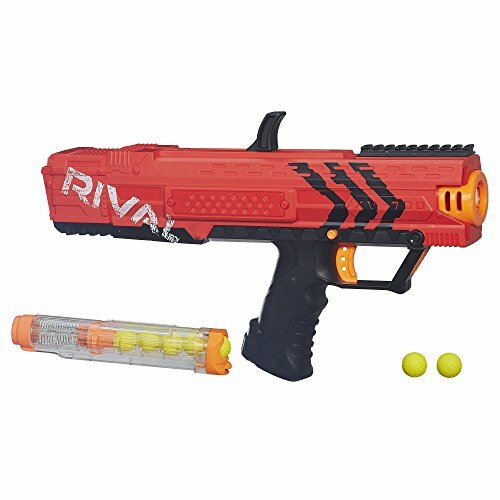 The Nerf RIVAL Nemesis truly is a revolutionary Nerf blaster with strongly improved performance and unique design and look-and-feel. This hugely powerful machine is a fully automatic Nerf blaster that comes with a gravity fed hopper system that can hold up to 100 rounds. Yes, you have 100 rounds to shoot before having to re-load! The Nemesis Hopper is an entirely new type of ammunition holder and works really well. The thing is though that because it works based on gravity, you can’t hold the blaster upside down. It simply won’t shoot any rounds if you don’t hold the blaster in a normal position. It can also sometimes happen that you need to shake the blaster a bit in order to feed the balls into the internal conveyor system. Not a big deal. One more important thing to point out is that the Nemesis requires 6 D-type batteries. Yes, those big ones. The good news is that Nerf has designed a rechargeable battery pack specifically for the RIVAL range of blasters. It’s just one big battery that you can keep recharging with a wall charger that comes with it. The Nerf RIVAL rechargeable battery pack is definitely recommended over a set of 6 D-type batteries, as it will save you a lot of money. 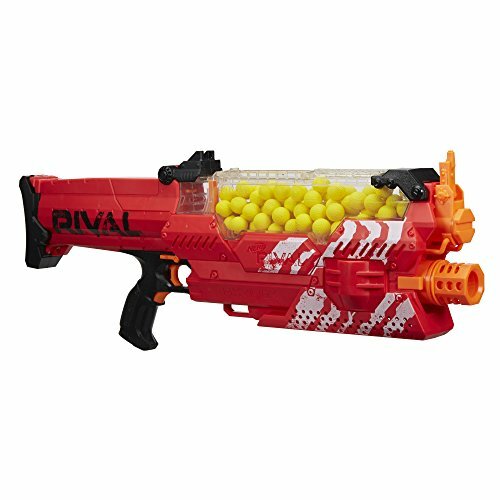 If you’re looking for excellent power and performance and you don’t mind the price tag, the RIVAL Nemesis is a phenomenal Nerf blaster that is lots of fun to shoot with. We found the Alphahawk to be the most appealing Nerf blaster in the newly released Accustrike series. As mentioned, the Accustrike series aims to improve accuracy with not only improved blasters but also re-designed darts. Accustrike darts . What’s great is that the darts are backwards compatible with Elite darts, so you can use your Elite darts in this blaster, but you can also use the Accustrike darts in your Elite blasters. Confusing sentence? Maybe just a little. The grip of the Alphahawk is comfortable and ergonomic for both small and larger hands. The cylinder holds five darts and can be easily opened to re-load with a simply push of a button. The priming mechanism with simple handles on the side feels easy and smooth and makes the right click sounds. Pulling the trigger for single fire is also pretty straightforward. Just like the Nemesis, the Nerf RIVAL Apollo XV-700 has been a very popular Nerf blaster from the day it was first released, with incredible performance and attractive looks. The Apollo comes standard with a seven-round magazine that holds seven high-impact rounds. The magazine is located in the handle and can be easily pulled out to re-load. To fire a round, simply pull the trigger. To prime, simply pull back the priming handle located on top of the blaster. The priming handle is a bit sturdy and needs some force in order to move it back and forth. While doing that, your other hand needs to work hard to keep the blaster stable. Other than that, the RIVAL XV-700 is an awesome blaster with excellent firing velocity, range and accuracy. 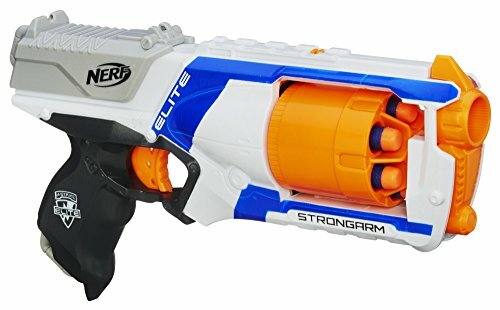 The Strongarm in the N-Strike Elite series is basically an improved version of the old Maverick REV-6 in the N-Strike series. 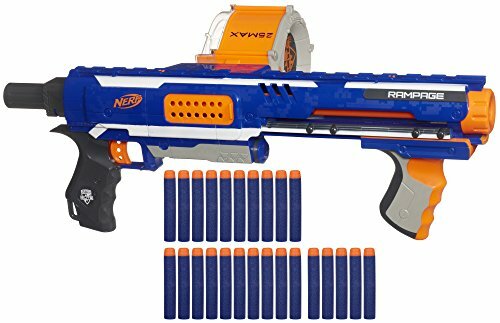 This revolver type Nerf blaster that comes with 6 Elite Darts that need to be loaded into a 6-dart barrel located at the front of the blaster. The Strongarm can shoot in both single-fire and slam-fire mode. To use slam-fire, simply keep the trigger pressed while repeatedly priming the gun. Both slam fire and single fire work well, but slam-fire gives you a better firing range. Using slam-fire though means you’ll need to sacrifice on accuracy due to the priming movement. The barrel is easy to load, just push the button and it pops out. Overall, the Strongarm is an awesome, compact Nerf blaster that achieves better accuracy than most other guns in the Elite range. The popular CycloneShock was introduced in 2015 as part of the N-Strike Mega sub-series. 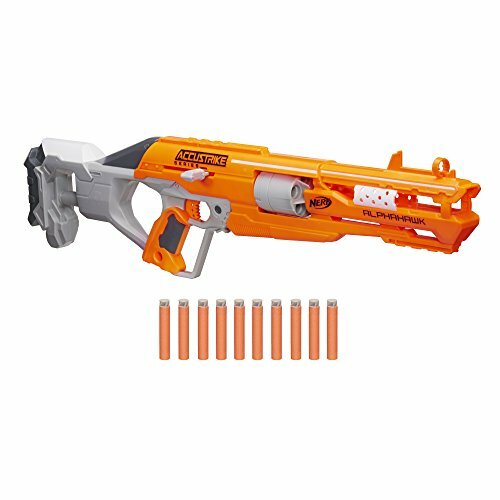 Very similar to the Strongarm, it’s a Nerf revolver-style blaster with a 6-dart barrel. Revolver type Nerf blasters are awesome because they are simple, robust, compact and usually perform really well. With the CycloneShock you can only use Mega darts, not the smaller Elite darts. Mega darts give you an improved firing range and very decent accuracy. Firing and priming in single- and slam-fire mode is easy. We love the CycloneShock because it’s a very cool looking and robust Nerf gun. Introduced in 2012, the Rampage is part of the Nerf N-Strike Elite series. N-Strike Elite blasters are often nothing more than upgraded versions of their counterparts in the Nerf N-Strike series. Just as the Elite Retaliator is a revamped version of the popular N-Strike Recon CS-6, the Elite Rampage is an upgraded version of the N-Strike Raider CS-35. The Rampage is one of the more popular blasters in the Elite range, with a smaller but improved 25-dart drum, a strong and comfortable grip and better looks. While its predecessor often had jamming issues, the Rampage doesn’t seem to have that at all. In addition, the firing range and accuracy are also much better. The Rampage can use both Elite darts and Streamline darts, but you would only want to use the Streamline darts if you already have them in your collection. When buying a Nerf gun, the best thing you can do is to not worry too much about accuracy. Nerf blasters are not designed to shoot accurately, they are designed to have loads of fun. In addition, reviews of Nerf guns that you can find online all have different things to say about how accurate they are. There’s not much science behind it, instead testing results are often quite random. The other option is to modify Nerf guns to improve their performance metrics such as firing range and accuracy. You can in fact also modify the darts to make them more accurate and aerodynamic, but this is only for the real gurus who know what they’re doing. Otherwise, if you just want to have some old-school Nerf blaster fun, forget about accuracy and instead focus on the features, the grip and the overall quality of the Nerf gun you are considering to buy next.